Little wonder that many yacht owners are tempted to pay premium prices in return for the confidence that they believe they will gain from putting the best product available into their auxiliary engines. But does ‘best’ mean what you think? Engine lubricants may be considered as having two main components: the base oil and the additive package. Mineral oil is a hydrocarbon, extracted from crude oil by distillation. It comprises a mixture of hydrocarbon molecules, of varying lengths. When this oil is exposed to high temperatures, such as on piston crowns and piston rings in high-performance engines, the shorter molecules are liable to ‘crack’, losing their hydrogen by burning and leaving their carbon behind as gums and deposits. This problem has become increasingly prevalent as the power output and internal temperature of engines has increased in the past 15 years or so. The response of the oil companies has been to develop synthetic oils. Although still hydrocarbons, they are not distilled from crude oil but instead are synthesized from liquids, such as hexene. The result is a fluid whose molecular length is closely controlled, giving it excellent properties at both high and low temperatures. The problem of gum deposition on high temperature surfaces has almost been eradicated by this development. Additives in engine oils are a complex package, containing up to 20 components intended to reduce wear and friction, control oxidation, reduce foaming, remove deposits, etc. As with base oils, some are designed to perform in high-performance engines and others are not. Logically, the high-performance additive packages go into the synthetic base oils whereas the lower-performance packages can be found in the mineral oils. When fuel burns in an engine, the combustion product is acidic. Engines that run at high power generate a more acidic product than do cooler ones, so the additive package is tailored to neutralise these acids. This property of lubricants is known as Total Base Number (TBN). The TBN of a synthetic lubricant intended for a turbo-charged engine running for extended periods at the top of its rev range might be 12 – 15. Conversely, the TBN of a lubricant designed for cool-running, low power duties such as yacht auxiliary engines will be about 3-4. Yacht owners may be puzzled by the fact that the consumption of a modern synthetic oil may be considerably less than that of an API CD oil. This is due to the fact that more modern oils contain viscosity improvers, clever molecules that increase their length when hotter. These are designed to reduce consumption but do not improve the oil’s lubrication properties. It is not necessary for the user to understand all this technical stuff because it has all been summarised for us in the API classification system. The full details of this system can be seen below. The operating manual for your engine will advise the type of oil it needs according to this classification. Very many small yacht engines, such as Yanmar, Volvo, Bukh, etc., call for oils to API CD which, as can be seen in the table, has been obsolete for many years. However, oils to this classification, or to the European equivalent ASEA E1, are still obtainable after a search. For reference, the TBN of API CD is 4, of API CE it is 10.5 and for API CF it is 16. API CF-4 was introduced for use with fuels having lower sulphur content, its TBN being reduced accordingly to about 8. What needs to be remembered is that lubricant development keeps in step with power requirements in the automotive field. Oil temperature, stress and change intervals in modern diesel cars and trucks bear little resemblance to the equivalents of 20 years ago. Yacht engine operation, however, has not changed in the slightest. The viscosity of an oil is the property that separates sliding and rolling surfaces. Monograde oils have viscosity values such as SAE 30, 40, 50 etc. A higher number indicates a higher resistance to flow and therefore a greater ability to separate surfaces. However, the resistance to flow of the higher numbers may be so great at low temperatures that components can come into contact with each other, leading to rapid failure. Multigrade oils have been developed to have lower viscosities at low temperatures, but relatively increased viscosities at operating temperatures. Multigrades have codes such as 15W-40, 5W-50, etc., where the number followed by the W is the viscosity at the lower temperature and the second figure is the equivalent monograde viscosity at operating temperature. Engine manufacturers have universally specified multigrade oils for many years. It is a fact of life that it takes more energy to pump more viscous oils around the engine. In the drive for improved fuel economy it is now common for lubricant viscosities as low as 5W-30 and even 0W-30 to be specified for car engines. The disadvantage of these low viscosities is that separation of lubricated components is reduced and wear increased. Modern car engines overcome this by hardening crankshafts, making bearings from various aluminium alloys and other means. This is not the case with yacht auxiliary engines, which universally use traditional metallurgy. Oils with viscosities of less than 15W-40 are thus inadvisable. Yacht auxiliary engines generally run for short periods, at lower temperatures than any other duty, and typically in the lower half of their rev range. From a lubricant point of view this is a very undemanding duty, accounting for their low API requirement. Combustion temperatures never reach levels at which a high-performance lubricant can be effective, so the overall chemistry in this area is not neutral but alkaline (basic). There is a great deal of evidence to show that use of an oil with a TBN that is too high for the duty can lead to several problems, particularly high wear rates of cylinder bores. The effect of high TBN engine oils in accelerating wear rates is well known. Burning high TBN oils may generate excessive deposits on the piston crown. As the piston tilts when moving up and down these deposits become compressed and will form a very hard and abrasive layer, causing excessive wear, mainly in the bore. Bore wear has similar detrimental effects as bore glazing, instead of a smooth glaze producing a highly polished surface that leads to poor lubrication and high oil consumption. 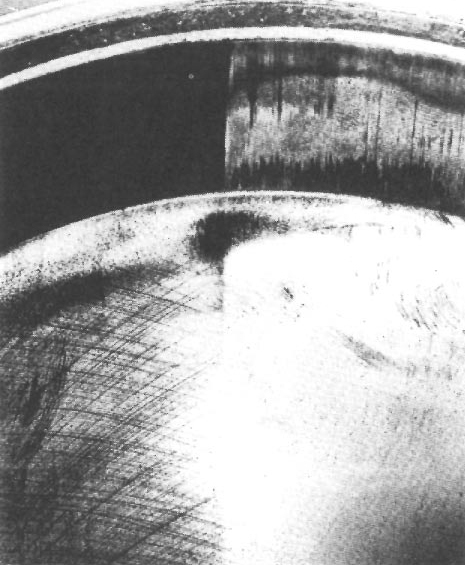 This composite photograph shows a normal honed bore on the left and a polished bore on the right. Note that the honing marks are not visible in the bore on the right. I pass this information on for what it’s worth. A couple of boats ago I had a Prout cat with an almost new but run in Yanmar 2gm in it. We took it on a long delivery trip in a flat calm, so the engine was running at steady revs for about 30 hours. By the time we got there it was drinking oil, never having consumed any beforehand. Subsequent discussions with both Yanmar technical and the Shell oil laboratories suggested that we had unwittingly committed two sins, the major one being that we had followed the normal idea of being kind to our engine by giving it good oil – a semi synthetic. Yanmar insisted that putting a higher grade modern oil in an old design engine was asking for trouble. I was sceptical so I spoke independently to Shell laboratories and to my surprise they said the same thing. They went so far as to say that we should never use synthetics in old design engines since there were components in the oil that could cause accelerated wear. The second factor was that we left the throttle alone for 30 hours and didn’t vary the engine speed. The result was bores polished to the point where you could see your face in them – literally. The block could not be recovered by honing ( we tried twice). After honing by a Yanmar agent the polish returned to the point where I went from full to empty on the dipstick within 8 hours running after my return to the UK. Total market Rubia H and Rubia B to API CD, see www.fcdawes.co.uk/pdf/COMMERCIAL.pdf . Otherwise, almost all car parts shops, Halfords, etc stock oils to API CD by less well-known manufacturers. Most French hypermarkets sell API CD oils by Exxon, Total, Elf and Shell, so it’s worth stocking up if you find yourself across the Channel. Yanmar’s own oil was to API CD until the introduction of the YM engine, when it became API CI-4. According to Yanmar this oil can be used in all engines requiring API CD upwards. Its TBN is between 10 and 12. Otherwise, use a quality oil to API CF-4, which is the official replacement for API CD. Also see advice on extended running in the Bore Glazing section of this website. But use a synthetic? I wouldn’t – although I do in my car. 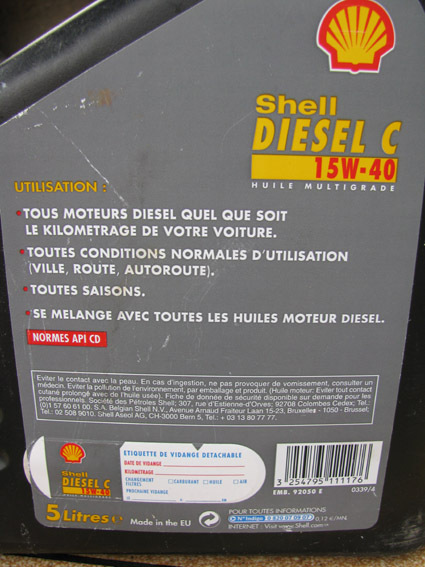 Shell diesel lubricant available in Europe but no longer marketed in UK. Viscosity is 15/40 and the oil is made to the standard API CD. Very many yacht engine manufacturers call for oil to this specification. CJ-4 Current Introduced in 2006. For high-speed, four-stroke engines designed to meet 2007 model year on-highway exhaust emission standards. CJ-4 oils are compounded for use in all applications with diesel fuels ranging in sulfur content up to 500 ppm (0.05% by weight). However, use of these oils with greater than 15 ppm (0.0015% by weight) sulfur fuel may impact exhaust after-treatment system durability and/or oil drain interval. CJ-4 oils are effective at sustaining emission control system durability where particulate filters and other advanced after-treatment systems are used. Optimum protection is provided for control of catalyst poisoning, particulate filter blocking, engine wear, piston deposits, low- and high-temperature stability, soot handling properties, oxidative thickening, foaming, and viscosity loss due to shear. API CJ-4 oils exceed the performance criteria of API CI-4 with CI-4 PLUS, CI-4, CH-4, CG-4 and CF-4 and can effectively lubricate engines calling for those API Service Categories. When using CJ-4 oil with higher than 15 ppm sulfur fuel, consult the engine manufacturer for service interval. CG-4 Current Introduced in 1995. For severe duty, high-speed, four-stroke engines using fuel with less than 0.5% weight sulfur. CG-4 oils are required for engines meeting 1994 emission standards. Can be used in place of CD, CE, and CF-4 oils. CF Current Introduced in 1994. For off-road, indirect-injected and other diesel engines including those using fuel with over 0.5% weight sulfur. Can be used in place of CD oils. CC Obsolete CAUTION: Not suitable for use in diesel-powered engines built after 1990. CB Obsolete CAUTION: Not suitable for use in diesel-powered engines built after 1961. CA Obsolete CAUTION: Not suitable for use in diesel-powered engines built after 1959.